« At last, the geographic cure worked once. Rounds from Dawn to the Newborn Nursery. Beauty is where beauty is found. 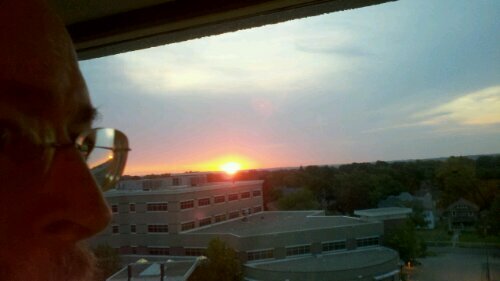 I started so early that when I saw my first hospital patient, a perfect sunrise broke as I entered the room on the top floor of the hospital. The water content of the atmosphere blocks the view of the sun most days till the red disc has ascended well above the horizon, but with the hot dry weather we’ve had, there was the sun, just peeking up. And the ICU offered a spectacular view of the city in the morning. The patient couldn’t speak and could barely respond. Even if the patient can’t talk, I speak to him or her, tell them who I am, the date, where they are and why they’re there, and I try to give a few headlines from the news. In this case I called attention to the phenomenal sunrise, but the patient didn’t look. From the ICU on 6th floor I went to see a new admission on 5 Medical, and discharged a patient who had recovered enough to go home. Striding down the corridor to the opposite end of the hospital I came to 5 Behavior Health, the psychiatric service. I did medical consultations on two patients admitted during the previous 24 hours. The psychiatric portion of the service consists mostly of people who didn’t ask for their problem but got it anyway. A surprising number of schizophrenics also qualify as bipolar. More than 90% smoke, and a lot of them come down with type I diabetes as their pancreas withers away. They lose years of life. A majority of schizophrenics also have drug and alcohol problems, and they can’t learn from their mistakes. Our society has failed our schizophrenics. At one time institutionalized, they were turned onto the streets when the institutions closed, and went right into the criminal justice system. The ones who stay out of incarceration use a lot of health care. Fourth floor holds the oncology (cancer) and surgery nursing units on the south. Contrast being the essence of meaning, I talked to those who know they have no cure and to those with a reasonable expectation of cure. The pediatrics wing sits on the north end of the fourth floor, and I had no patients there. Fewer and fewer children need admission to the hospital as the years wear on. Vaccinations have prevented most measles, mumps, chickenpox, polio, rotavirus, pneumococcal, and meningococcal disease. We see a tenth of the croup that we used to. On the third floor orthopedics unit I did two consultations for people after total joint replacement, and on the second floor I took care of two newborns. Death, the ultimate drama and the ultimate irony, came to three of my patients during the day. One in middle age died surrounded by grieving family. One went unexpectedly and alone. A third died so old and full of years that few remained to note the death, though many, on reading the obituary, will sigh and reflect on how the passing impoverished the world. This entry was posted on July 26, 2012 at 9:19 pm and is filed under Being a doctor. You can follow any responses to this entry through the RSS 2.0 feed. You can leave a response, or trackback from your own site.